It is currently widely accepted among clinicians that chronic tendinopathy is caused by a degenerative process devoid of inflammation. Current treatment strategies are focused on physical treatments, peritendinous or intratendinous injections of blood or blood products and interruption of painful stimuli. Results have been at best, moderately good and at worst a failure. The evidence for non-infammatory degenerative processes alone as the cause of tendinopathy is surprisingly weak. There is convincing evidence that the inflammatory response is a key component of chronic tendinopathy. Newer anti-inflammatory modalities may provide alternative potential opportunities in treating chronic tendinopathies and should be explored further. Initially recognised by Puddu et al4 as long ago as the 1970s, in chronic tendinopathy there is an absence of acute inflammatory cells in the load-bearing regions of tendons.4 As histological data became more readily available this view became increasingly recognised. Several studies demonstrated collagen separation, thinning and disruption without an inflammatory cell infiltrate.5–7 There was also evidence from some animal studies that degenerative non-inflammatory tendon changes could be experimentally introduced over a brief (1 or 2 week) period.8 The pathology of chronic tendon disorders was correctly recognised as being very different from that of a characteristically inflammatory disease, such as rheumatoid arthritis (RA). The move away from ‘tendinitis’ thinking was summed up concisely in a BMJ Editorial by Khan et al1 when practitioners and educators were urged “to accept the irrefutable evidence that the term tendinitis must be abandoned to highlight a new perspective on tendon disorders”. At the time of the Editorial it was necessary for a strong message to be sent that chronic tendinopathy had a different aetiology to inflammatory conditions such as RA, and to emphasise that traditional strategies such as corticosteroid injection and NSAIDs do not adequately address the pathology. Although this remains an important message, we believe to regard all chronic tendinopathy as entirely non-inflammatory is an oversimplification to the point of being misleading. During the first decade of the 21st century ‘non-inflammatory’ or ‘degenerative’ theories have dominated thinking in tendinopathy. Various models have been proposed. First there are models that attempt to explain why tendons fail. The cumulative damage and vascular insufficiency models fall into the first group.2 Second, a group of models attempts to explain why tendons fail to repair themselves and includes the ‘failed healing response’9 and the continuum theories of tendinopathy.10 These theories and the degenerative ‘paradigm’ in general, have become extremely influential. Physical exercises including eccentric exercises (EE) or other progressive loading regimes. Treatments using blood and blood products that aim to improve tendon healing and remodelling. Treatments that aim to reduce the pain associated with tendinopathy rather than heal the tendon itself (such as sclerosant or high-volume injections). While there may be a degree of overlap between the treatment groups (eg, ESWT may influence pain processing) the point is none of these treatments are anti-inflammatory in nature. A second area of treatment options are blood and blood products, including bone marrow-derived cells. Initial encouraging data from the equine field demonstrated the potential of stem cells to repair the hypoechoic lesions seen on ultrasound (US).18 This method, requiring a bone marrow biopsy and in vitro cell expansion, is complicated and has not become routine in human clinical practice. However, in humans, many attempts have been made to help ‘repair’ tendons by the use of more readily available agents particularly autologous blood and autologous blood products (principally platelet-rich plasma, PRP). The suggestion is that the cells and growth factors (such as vascular endothelial growth factor (VEGF) and insulin-like growth factor-1 (IGF-1) in PRP)19 or other components of these preparations promote healing. While small uncontrolled studies have shown benefits from these treatments,20 ,21 evidence of the efficacy of these treatment strategies in good-quality in vivo studies is currently lacking. Indeed for PRP the level 1 evidence is that PRP is ineffective for mid-portion Achilles tendinopathy.22 Proponents of PRP argue that as there are numerous ways of preparing PRP and some methods may be more effective than others. Nevertheless, there is currently minimal scientific evidence that either PRP or autologous blood is effective when compared to placebo or no injection and further studies are going on. Throughout the last decade the belief that chronic tendon conditions occur due to degeneration has become the prevailing paradigm. Unfortunately, with the possible exception of mid-Achilles tendinopathy, the last decade has not provided us with therapies that are successful at ‘healing’ the failing tendon. However, is it certain that inflammation is not involved in the development or progression of tendinopathy? And if so are there other potential treatment options that have been overlooked? Although it was certainly progress to stop referring to all symptomatic tendons as ‘tendinitis’; does referring to all chronic tendons as ‘degenerative’ risks throwing the baby out with the bathwater? Ironically, it is now the ‘tendinosis’ paradigm that has itself become just as deeply ingrained in the medical literature as the original tendinitis concept. This has had two detrimental consequences. First, it oversimplifies our understanding of the pathological processes. Second it may lead us to ignore potentially effective treatments in chronic tendinopathy. It is not suggested that acute inflammation is the dominant pathology in all phases of established tendinopathy. However, it is likely that elements of the inflammatory response play a role in the progression or continuation of tendon disrepair. If so, could anti-inflammatory strategies be therapeutic in the chronically pathological tendon? Let us examine the case for the involvement of inflammation and inflammatory mediators in chronic tendinopathy. The ‘tendinopathy paradigm’ was developed from several historical studies that had failed to show the presence of acute inflammatory cells (such as neutrophils and macrophages) in chronic tendinopathy, or indeed in the early stages of tendon overload. From this there was an inference that both acute and chronic tendinopathies are devoid of inflammation. However, there have been major advances in immunohistochemistry and gene expression analysis subsequently. Several studies, in both humans and in animal models, have shown an inflammatory reaction both in established tendinopathy and in the early overload response. Schubert and coworkers27 have demonstrated the presence of macrophages and T and B lymphocytes in chronic Achilles tendinopathy using primary monoclonal antibodies (against CD68 for macrophages, CD3 for detection of T-lymphocytes and against CD20 for detection of B lymphocytes). The authors also studied asymptomatic spontaneously ruptured tendons and in contrast found large numbers of granulocytes (to be expected in the case of an acute traumatic event) but did not see significant numbers of macrophages, T- or B-lymphocytes. Most studies of tendon pathology have histologically demonstrated an increase in tenocytes and that the tenocytes are larger than normal.36 Tenocytes are well known to proliferate and become more metabolically active in response to cytokines and growth factors that are part of the inflammatory response (eg, platelet-derived growth factor (PDGF), IGF-1 and TGF-β). Thus tenocyte hyperplasia and hypertrophy may provide indirect evidence of up-regulated inflammatory mediators. It is possible that over time our understanding of tendinopathy will more closely resemble our current understanding of the pathological processes in osteoarthritis (OA). It is no longer believed that OA is caused simply by ageing and cartilage loading but indeed is an active process with infiltration of inflammatory cells (including CD4 T-cells)37 ,38 and natural killer cells.39 Again in OA mechanical overload (of the cartilage tissue) remains a key driver of pathology but the point is the evidence suggests it is mediated through elements of the inflammatory response. Furthermore, even if inflammation is not seen at a particular point in time, this in itself does not necessarily imply it is not inflammation that has caused tendinopathic changes in the first place. For example, in RA it is not disputed that inflammation causes damage. However, in treated RA (in clinical remission) damage (degeneration) is the key histological finding which will be accompanied by a lack of an inflammatory infiltrate. Two major molecular mechanisms of angiogenesis have been described—a hypoxia-dependent pathway and also a hypoxia-independent pathway.41 Pathological tendons are only one of several pathologies that exhibit neovessel formation. These include inflammatory arthritis (such as RA, psoriatic arthritis and ankylosing spondylitis), OA, ischaemia, malignancy and diabetic retinopathy. Nevertheless, there is a common view that neovessels are synonymous with ‘tendinosis’. Certainly many radiologists report neovessels as providing evidence of tendinosis. This is factually incorrect. Tendinosis is a histological term, which confirms that no inflammation is present; its presence cannot be confirmed or rejected following a US scan. It is also misleading as in order for neovessels to sprout it is very likely (in fact probably essential) that inflammatory mediators are involved at some stage in the process. 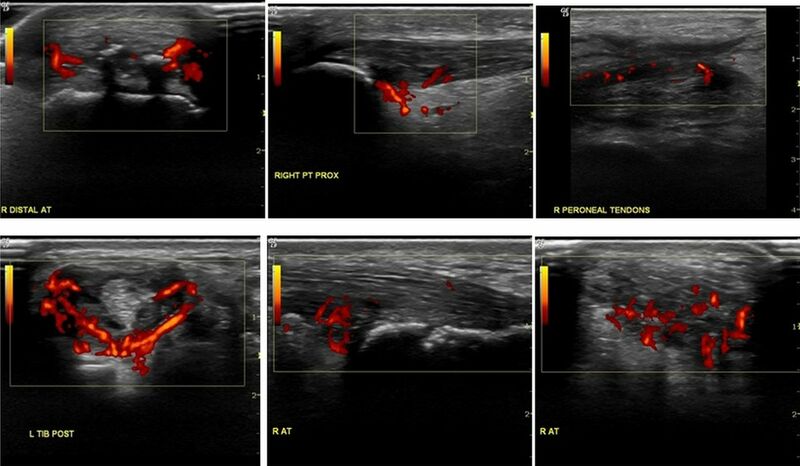 Power Doppler US assessment of, for example, an entheseal lesion or tendon body in a confirmed rheumatological inflammatory arthritis can look indistinguishable from that seen in a ‘degenerative’ tendinopathy (see figure 1). Power Doppler ultrasound in ‘overuse’ and ‘inflammatory’ tendon disorders. Sonographically it is often impossible to determine the cause of tendinopathy from Power Doppler signals. The top row of images are all of patients without underlying rheumatological diagnosis and in whom mechanical overload or injury was the cause of the tendinopathy (from left to right insertional Achilles tendinopathy, proximal patellar tendon pathology and mid-peroneal tendon pathology). The bottom row of images is of patients with a known inflammatory rheumatological diagnosis. From left to right tibialis posterior tendinopathy (in RA) and insertional Achilles tendinopathy in a patient with reactive arthritis (longitudinal and transverse sections). There are several biochemical mediators that have been demonstrated to have an influence on the development and progression of chronic tendinopathy. These include the COX-1 and COX-2, matrix metalloprotineases (MMPs) and substance P.
The cyclooxygenase pathway is involved in classical inflammatory conditions (such as RA) and additionally processes with a more moderate degree of ongoing inflammation (such as osteoarthritis). It is known that peritendinous administration of prostaglandin E1 (PGE1)29 and elevated levels of PGE230 ,31 may lead to tendinopathic changes in tendon models. This process may, at least in part, be secondary to a failure of specific MMP regulation in response to repeated mechanical stimulus. Manipulation of MMPs, possibly through cytokine manipulation or inhibition, therefore provides potential to positively influence the role of MMPs in tendon degeneration and repair. So what can we conclude? There is a substantial, and growing, body of evidence indicating that ongoing tendon degeneration is an active process with involvement of many aspects of inflammation-mediated responses. This paper has explored pathological mechanisms that are implicated in tendinopathy. By understanding better the pathology responsible for chronic progressive tendinopathy, this gives us the potential to rationally assess therapies that may be of benefit. Chronic tendinopathy should be regarded as a process of degradation which appears to involve many aspects of the chronic injury–repair response, in common with other musculoskeletal rheumatological disorders. This degradation process, with characteristic features of neovessel formation, neoinnervation and synovitis, provides us with potential targets to modify the degradation process in a positive way. This section of the paper describes the potential for ‘anti-inflammatory’ and other strategies to beneficially modulate both the chronic tendinopathy degradation and progressive tendinopathy process. Over the last 15 years the use of NSAIDs and corticosteroids has become less fashionable and more controversial in the management of chronic tendinopathy. But what does the evidence tell us? If inflammatory mediators are part of ongoing tendinopathy we should expect anti-inflammatory strategies to be at least partially effective in reducing tendon pain. There is substantial evidence that corticosteroids can be effective in chronic tendinopathy at relieving pain, reducing swelling and improving function in the short term—although at the expense of greater risk of long-term recurrence. The exact mechanism by which corticosteroids have an effect on tendon pain is unclear. Corticosteroids are to some extent indirect vasoconstrictors, through suppression of production of the vasodilators prostacyclin and nitric oxide (NO) as well as exhibiting anti-inflammatory effects. They may also influence the perception of pain by altering local nociception. The challenge is to determine exactly how corticosteroids exert their beneficial effect on nociceptive and inflammatory pathways, and to develop more refined future therapies without the long-term increased risk of symptom recurrence. NSIADs have a more specific anti-inflammatory role when compared with that of corticosteroids and remain in common clinical use. Most are non-selective inhibitors of COX which catalyses the formation of prostaglandins and thromboxane from arachidonic acid. The beneficial effects of NSAIDs on tendon pain may be related to their anti-inflammatory properties or possibly via analgesia effect/modulation of nociception.2 Unlike acetaminophen (paracetamol), which is not considered an NSAID and whose nociceptive effects are mainly mediated by blocking COX activity in the central nervous system (CNS), most NSAIDS penetrate poorly into the CNS, and indeed topical NSAIDs would not be expected to reach levels within the CNS capable of exerting a clinically meaningful analgesic effect. The key point here is that the apparent effect of NSAIDs on tendon pain in multiple studies suggests a potential role of inflammation in chronic tendinopathy. Inhibition of TNF-α, by synthetic monoclonal biological agents (either as a neutralising antibody or a soluble TNF receptor) is highly effective in treating inflammation associated with active RA and sero-negative spondyloarthritis including ankylosing spondylitis. These agents have powerful anti-inflammatory actions and have been shown to regulate IL6, IL8, MCP-1 and VEGF, reduce angiogenesis and reduce blood levels of MMP-1 and MMP-3.62 These monoclonal antibodies are potent inhibitors of TNF. Use of these agents in a systemic manner is not straightforward and has not yet been studied. They are expensive (approximately £10 000 per inflammatory arthritis patient treated per calendar year). Additionally, they are powerful immunosuppressants with re-activation of latent TB a particular and serious concern. Nevertheless, the pilot study demonstrates that targeting TNF-α or other inflammatory cytokines could be a valid approach in chronic progressive tendinopathy. More studies are required. Increased levels of glutamate, originally thought to be confined to the CNS have been documented to be present in microdialysis of symptomatic Achilles tendon tissue.70 Furthermore, elevated levels of the glutamate receptor, N-methyl-d-aspartate receptor type 1 (NMDAR1) have also been documented in chronic tendinopathy.71 In this study of patients with symptomatic patellar tendinopathy there was a 9-fold increase of NMDAR1 and a 10-fold increase of glutamate compared with controls. It was suggested by the authors of this paper that the neuronal coexistence of elevated NMDAR1 and glutamate suggests a regulatory role in intensified pain signalling. Coexistence is the presence of two or more transmitters in a single neuron.72 This leads to the possibility that inhibition of substance P and/or glutamate could be beneficial not only in reducing pain but also in reducing ongoing tendon degradation. Neovessels: can we inhibit their formation? If the process of neovascularisation leads to painful neoinnervation then treatments that stop or hinder the neovascularisation may be successful at reducing the pain in chronic tendinopathy. Current treatments (eg, high-volume injections) treat neovessels once they have occurred, but there is a tendency for the neovessels to reform postprocedure. Potentially, agents that inhibit VEGF and other agents involved in neovessel formation may inhibit their formation and propagation. Nerve growth factor (NGF) is essential for the maintenance of both sensory and sympathetic neurones and refers to a single protein. Nerve growth factor belongs to a family of factors also known as neurotrophins and include brain-derived neurotrophic factor (BDNF). Both NGF and BDNF together with the neurotrophin receptor p75 have been detected in Achilles tendon tenocytes.73 NGF is believed to play a role in the development of neuropathic pain. NGF inhibitors, including the monoclonal antibody to NGF tanezumab, are currently undergoing phase 2 clinical trials and, if the trials are successful, could be an option in chronic tendon pain with neoinnervation. Tendinopathy remains both an extremely common condition and a condition with few truly effective treatments. Over the last decade various models have been proposed to explain the pathological process underpinning tendinopathy. These models have suggested a primarily degenerative pathological process and some have clearly stated that the process of tendon overuse pathology is non-inflammatory in nature. Indeed this has become a paradigm for thinking about tendinopathy. This paper has highlighted the limitations of this current view. More modern research tools have confirmed the presence of inflammatory cells including macrophages and lymphocytes in chronic tendinopathy, particularly in closely associated tissue (eg, bursa or paratenon). In addition to inflammatory cells, there is evidence that numerous other mediators including substance P, MMPs, VEGF and COX which play a role in chronic tendon pathology. This does not mean that the pathology of chronic tendinopathy mirrors that of inflammatory arthritis. We do not advocate going back to the ‘tendinitis’ model, and there is no doubt that a shift away from primarily anti-inflammatory strategies has had great benefit for tendinopathy treatments, by placing the emphasis on active rehabilitation to attempt to regain function and potentially lead to enhanced tissue remodelling. Mechanical overload is still likely to be the dominant factor involved in initiation of an inflammatory response—the point is that at least some of the damage caused by this overload is mediated through a process that involves elements of the inflammatory process. An appreciation of the basic science involved in tendinopathy gives us a whole new potential armamentarium of treatments that we can use. It is hoped that tendon research will be driven by a greater awareness of the potential for managing and targeting the inflammatory response. What this paper add to this subject? Chronic tendinopathy incorporates elements of the inflammatory response. The term tendinosis should not be used to describe the radiological appearances of neovascularisation. More emphasis should be placed on the potential for anti-inflammatory strategies in chronic tendinopathy. 1. The following terms best describe tendinosis. B. A tendon which demonstrates grey scale changes on ultrasound (US) (such as thickening and hypoechogenecity). C. It is a histological term reserved for the histological appearance of a tendon. D. Can be correctly diagnosed on MRI scan. E. Implies inflammation is present. Correct answer—C. The term tendinosis, although used regularly to describe the US and MRI appearances of a tendon, is actually defined as a tendon demonstrating degenerative change and devoid of an inflammatory infiltrate. Therefore this term should not be used to describe the appearances of a tendon using a US or an MRI. A. A “multi-mediated phenomenon, of a pattern type in which all mediators would come and go at the appropriate moment... increasing vascular permeability, attracting leucocytes, producing pain, local edema and necrosis”. B. Always characterized by the presence of all five cardinal signs: heat, swelling, redness, pain and loss of function. C. Never occurring in tendons or their surrounding tissues (paratendon, bursae etc). D. The focus of treatment for a patient with chronic tendinopathy. E. Always being necessary for tissue healing. Correct answer: A. The biochemical definition of inflammation (Rocha e Silva, 1974) is widely accepted today. Inflammation is not a single phenomenon. It is a rather wide-reaching concept, which includes a multitude of events which may occur together or independently to varying extents. Thus, elements of an inflammatory response may be present without all five cardinal signs. Following either acute injuries (eg, laceration and contusion) or acute bouts of mechanical load, both the tendon and its surrounding tissues may experience bouts of inflammation. Over time, this may lead to the loss of tendon structure, scarring, adhesions, metaplasia etc. The focus of treatment for a chronic tendinopathy should be load management and graduated rehabilitation with attention to optimal biomechanics. Tissue healing can occur through intrinsic cellular activity, in the absence of inflammatory cells or cardinal signs. 3. Regarding neo-vascularity, which of the following statements is most appropriate? A. The presence of neo-vessels confirms a diagnosis of tendinosis. B. The extent of neo-vascularity correlates well with the clinical severity of tendinopathy. C. The appearances of a tendon in clinically confirmed ankylosing spondylitis are often indistinguishable from those of a case of ‘degenerative’ tendinopathy when visualised on power Doppler US. D. Neo-vessels are only seen in tendinopathy. E. Insulin-like growth factor 1 (IGF-1) is thought to be responsible for the formation of both neo-vascularity and neo-innervation. Answer C. Tendinosis is only a histological diagnosis. Neo-vascularity does not necessarily correlate well with clinical severity. Neo-vessels are seen in a number of other pathologies such as rheumatoid arthritis, ankylosing spondylitis and diabetic retinopathy. Vascular endothelial growth factor (VEGF) is thought responsible for the neo-vessel formation. A. They are techniques performed on the tendon directly. B. The main aim is to improve tendon healing. C. The effect is believed to be through the interruption of neural stimulation. D. These techniques are usually performed surgically. E. They are usually performed with blood or blood products. Correct answer—C. Denervation techniques, such as high-volume paratenon stripping of the Achilles tendon, do not require surgery although surgical variants have been described. The beneficial effect is believed to be through interruption of neural ingrowth and/or nociceptive input. They are not performed with blood or blood products. 5. Which of the following statements regarding substance-P is incorrect? A. It is a neuropeptide. B. Along with calcitonin gene-related peptide (CGRP), it is significantly expressed in chronic tendinopathy. C. It acts as a proinflammatory mediator. D. It increases the ratio of type IV: type I collagen mRNA, which could contribute to the formation of smaller collagen fibres seen in tendinopathic tendons. E. It coexists with the neurotransmitter glutamate in primary afferents that respond to painful stimuli. Answer D. Increases the ratio of type III: type I collagen. All other statements are correct.
. Time to abandon the “tendinitis” myth. BMJ 2002;16:626–7.
. Current concepts in the management of tendon disorders. Rheumatology 2006;45:508–21.
. A classification of Achilles tendon disease. Am J Sports Med 1976;4:145–50.
. Chronic Achilles tendinopathy. A survey of surgical and histopathologic findings. Clin Orthop Relat Res 1995;316:151–64.
. Histopathological findings in spontaneous tendon ruptures. Scand J Med Sci Sports 1997;2:113–18.
. Tendon and myo-tendinous junction in an overloaded skeletal muscle of the rat. Anat Embryol (Berl) 1988;179:89–96.
. Failed healing responses. In: Leadbetter W, Buckwater J, Gordon S, eds. Tendon trauma and overuse injuries. Park Ridge, IL: American Orthopedic Society for Sports Medicine, 1989, 609–18.
. Eccentric loading, shock-wave treatment, or a wait-and-see policy for tendinopathy of the main body of tendo Achilles: a randomized controlled trial. Am J Sports Med 2007;35:374–83.
. Treatment of patellar tendinopathy—a systematic review of randomized controlled trials. Knee Surg Sports Traumatol Arthrosc 2012;20:1632–46.
. Progressive resistance training in patients with shoulder impingement syndrome: literature review. Reumatismo 2009;61:84–9.
. Effectiveness of different methods of resistance exercises in lateral epicondylosis—a systematic review. J Hand Ther 2011;25:5–25.
. Eccentric overload training for patients with chronic Achilles tendon pain—a randomised controlled study with reliability testing of the evaluation methods. Scand J Med Sci Sports 2001;11:197–206.
. Corticosteroid injections, eccentric decline squat training and heavy slow resistance training in patellar tendinopathy. Scan J Med Sci Sports 2009;19:790–802.
. Mesenchymal stem cell therapy for equine tendinopathy. Disabil Rehabil 2008;30:1752–8.
. Current opinions on tendinopathy. J Sport Sci Med 2011;10:238–53.
. Is ultrasound guided autologous blood injection an effective treatment? Br J Sports Med 2006;40:935–39.
. Ultrasound-guided autologous blood injection for tennis elbow. Skeletal Radiol 2006;35:371–7.
. Platelet-rich plasma injection for chronic Achilles tendinopathy. JAMA 2010;303:144–9.
. Is vasculo-neural ingrowth the cause of pain in chronic Achilles tendinosis? An investigation using ultrasonography and colour Doppler, immunohistochemistry, and diagnostic injections. Knee Surg Sports TraumatolArthrosc 2003;11:334–8.
. Sclerosing injections to areas of neo-vascularisation reduce pain in chronic Achilles tendinopathy: a double-blind randomised controlled trial. Knee Surg Sports Traumatol Arthrosc 2005;13:338–44.
. High volume image guided injections in chronic Achilles tendinopathy. Disabil rehabil 2008;30:1697–708.
. Novel approaches for the management of tendinopathy. J Bone Joint Surg Am 2010;92:2604–13.
. Achilles tendinosis is associated with sprouting of substance P positive nerve fibres. Ann Rheum Dis 2005;64:1083–6.
. Significance of granulation tissue in torn supraspinatus insertions: an immunohistochemical study with antibodies against interleukin-1 beta, cathepsin D, and matrix metalloprotease-1. J Orthop Res 1997;15:33–9.
. The effects of prolonged peritendinous administration of PGE1 to the rat Achilles tendon: a possible animal model of chronic Achilles tendinopathy. J Orthopaed Sci 2001;6:349–57.
. Wang production of PGE2 increases in tendons subjected to repetitive mechanical loading and induces differentiation of tendon stem cells into non-tenocytes. J Orthop Res 2010;28:198–203.
. Repeated exposure of tendon to prostaglandin-E2 leads to localized tendon degeneration. Clin J Sport Med 2005;15:27–33.
. Increased expression of IL-6 family members in tendon pathology. Rheumatology (Oxford) 2012;51:1161–5.
. Transforming growth factor-β isoform expression in chronic Achilles tendinopathy and their effects on tendon cell populations. Int J Exp Pathol 2000;81:A11–12.
. Increased substance P in subacromial bursa and shoulder pain in rotator cuff diseases. J Orthop Res 1998;16:618–21.
. Chronic Achilles paratenonitis with tendinosis: an experimental model in the rabbit. J Orthop Res 1990;8:541–7.
. T-cell mediated inflammatory pathway in osteoarthritis. Osteoarthritis Cartilage, 1999;7:401–2.
. T helper cells promote disease progression of osteoarthritis by inducing macrophage inflammatory protein-1γ. Osteoarthritis Cartilage 2011;19:728–36.
. Synovial tissue-infiltrating natural killer cells in osteoarthritis and periprosthetic inflammation. Arthritis Rheum 2010;62:3799–805.
. A comparison of clinical vs ultrasound determined synovitis in rheumatoid arthritis utilizing gray-scale, power Doppler and the intravenous microbubble contrast agent ‘Sono-Vue’. Rheumatology (Oxford) 2007;46:454–9.
. Angiogenesis in health and disease. Nat Med 2003;9:653–60.
. Comparison of ultrasonographic assesment of synovitis and joint vascularity with radiographic evaluation in a randomized, placebo-controlled study of infliximab therapy in early rheumatoid arthritis. Arthritis Rheum 2004;50:1107–16.
. Substance P accelerates hypercellularity and angiogenesis in tendon tissue and enhances paratendinitis in response to Achilles tendon overuse in a tendinopathy model. Br J Sports Med 2011;45:1017–22.
. Matrix metalloproteinase activities and their relationship with collagen remodelling in tendon pathology. Matrix Biol 2002;21:185–95.
. The pathogenesis of tendinopathy. A molecular perspective. Rheumatology 2004;43:131–42.
. -Matrix metalloproteases: a role in overuse tendinopathies. Br J Sports Med 2005;39:789–91.
. Substance P enhances collagen remodeling and MMP-3 expression by human tenocytes. J Orthop Res 2013;31:91–8.
. Role of substance P in inflammatory arthritis. Ann Rheum Dis 1992;51:1014–18.
. Aprotinin, corticosteroids and normosaline in the management of patellar tendinopathy in athletes; a prospective randomized study. Sports Exerc Inj 1997;3:111–15.
. Effect of ultrasound-guided, peritendinous injections of adalimumab and anikinra in chronic Achilles tendinopathy. Scan J Med Sci Sports 2009;19:338–44.
. Physiotherapy, steroid injections, or rest for lateral epicondylosis? What the evidence suggests. Pain Pract 2005;5:203–15.
. Mobilisation with movement and exercise, corticosteroid injection, or wait and see for tennis elbow: randomised trial. BMJ 2006;333:939.
. Achilles paratendonitis: an evaluation of steroid injection. Br J Sports Med 1988;22:64–5.
. Fluoroscopically guided low-volume peritendinous corticosteroid injection for Achilles tendinopathy. A safety study. J Bone Joint Surg Am 2004;86:802–6.
. Corticosteroid injections for shoulder pain. Cochrane Database Syst Rev 2003;(1):CD004016.
. Achilles tendon rupture following steroid injection: report of three cases. J Bone Joint Surg Am 1983;65:1345–7.
. Tendon rupture after local steroid injection. South Med J 1979;72:827–30.
. Etiology, diagnosis, and treatment of tendonitis: an analysis of the literature. Med Sci Sports Exerc 1998;30:1183–90.
. Treatment of tendinopathy: What works, what does not, and what is on the horizon. Clin Orthop Relat Res 2008;466:1539–54.
. Interventions for treating acute and chronic Achilles tendinitis. Editorial Group: Cochrane Bone, Joint and Muscle Trauma Group. Published Online: 21 Jan 2009 Assessed as up-to-date: 29 Dec 2000.
. A nationwide study of mortality associated with hospital admission due to severe gastrointestinal events and those associated with nonsteroidal antiinflammatory drug use. Am J Gastroenterol 2005;100:1685–93.
. Anti-TNF alpha therapy of rheumatoid arthritis: what have we learned? Ann Rev Immunol 2001;19:163–96.
. TNF-induced signalling in apoptosis. J Clin Immunol 1999;19:350–64.
. A “polypill” for acute tendon pain in athletes with tendinopathy?. J Sci Med Sport 2008;11:235–8.
. Versican splice variant messenger RNA expression in normal human Achilles tendon and tendinopathies. Rheumatology (Oxford) 2004;43:969–72.
. Expression profiling of metalloproteinases and tissue inhibitors of metalloproteinases in normal and degenerate human Achilles tendon. Arthritis Rheum 2006;54:832–42.
. Collagens, proteoglycans, MMP-2, MMP-9 and TIMPs in human Achilles tendon rupture. Clin Orthop Relat Res 2008;466:1577–82.
. Discovery of highly potent and selective small molecule ADAMTS-5 inhibitors that inhibit human cartilage degradation via encoded library technology (ELT). J Med Chem 2012;55:7061–79.
. Endogenous substance P production in the Achilles tendon increases with loading in an in vivo model of tendinopathy-peptidergic elevation preceding tendinosis-like tissue changes. J Musculoskelet Neuronal Interact 2011;11:133–40.
. In situ microdialysis in tendon tissue: high levels of glutamate, but not prostaglandin E2 in chronic Achilles tendon pain. Knee Surg Sports Traumatol Arthrosc 1999;7:378–81.
. Substance P injections enhance tissue proliferation and regulate sensory nerve ingrowth in rat tendon repair. Scand J Med Sci Sports 2011;4:562–9.
. Neuropeptides and coexistence. In: Intercellular communication in the nervous system ed robert malenka, London: Academic Press, Elsevier, 2009:525–9.
. Unexpected presence of the neurotrophins NGF and BDNF and the neurotrophin receptor p75 in the tendon cells of the human Achilles tendon. Histol Histopathol 2009;24:839–48. Contributors JR and MS have contributed to the original concept, research, writing of article, editing and approval of the final draft. AS has given suggestions on original concept, editing, additional ideas and approval of the final draft.